Daimler had a good third quarter. Daimler has set new unit sales and revenue records for its third quarter, reporting 13 per cent rises in both categories compared to the same period last year. Based mostly on the back of the car division, revenue for the company rose to €37.3 billion (A$57.37b) for the three months, while unit sales across the car and commercial vehicles reached 720,000. Daimler Trucks’ unit sales rose two per cent to 128,500 vehicles, aided by a record 52,200 trucks sold in the North American Free Trade Agreement (NAFTA) region of the US, Canada, and Mexico. Western Europe also saw a positive 12 per cent return for the quarter, but continued declines in Latin America (down 37 per cent) and a slump in Asia (down six per cent) impacted numbers. Revenue for the division rose to €9.7 billion (A$14.92b), up 14 per cent on 2014; while earnings before interest and tax (EBIT) numbers were the highest for a quarterly period and return on sales numbers also bested 2014. The van segment also broke a unit sales record for the third quarter, selling 75,700 vehicles, while also increasing revenue by €300 million (A$461.40m) on last year. Daimler says the demand in Europe and the NAFTA region helped it achieve a stable return on sales and a €17 million (A$26.15m) operating profit increase for the quarter. Daimler Buses did not have the same positive quarter, however, with sales falling from 8,600 units last year to 7,400. The decrease in unit sales reflected in the division’s revenue numbers, dipping from €1,034 million (A$1,590.29m) to €1,018 million (A$1,565.68m). Despite the drop in revenue and sales, return on sales and EBIT numbers were up on last year. 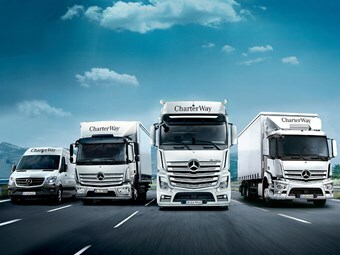 Daimler Trucks expects to achieve a slight growth on the 2014 annual numbers by the end of the year, while Mercedes-Benz Vans predicts significant growth. The bus team says numbers will likely fall below 2014.